Yeah the software of Live 10 brings some cool features… but… we also have some rad improvements to the Push. In this article, we are going to be talking about Live 10 and the new features added to the Push. One of the biggest new Features in the update is the 32-step sequencer. When Ableton gave us the Melodic sequencer update in Live 9.1 I was excited. Playing with it over time I realized there were so many things I couldn’t do. It didn’t quite have some of the functions I needed when sequencing melody. It’s great for baselines, but that is about it. Well… Ableton fixed that with the 32-step sequencer. The new Note Layout Mode on the push gives you a 32-step sequencer on the top half of the pad matrix and 32 notes on the bottom half. You can press pads in the lower section to select which notes to add via the step sequencer, in the upper section. Users can see, add, and remove pitches from steps by holding the respective pads. In otherwords, you can play a chord and then press one pad on the sequencer to add that chord. Wow… this is a game changer. Here is the official Ableton video on the new 32-step sequencer. Ableton Live also gives us some added functions which speed up your workflow. Introduced a root level ‘Collections’ folder for color labels/collections in the Push 2 browser in Live 10. This prevents other important root level items like ‘User Files’ from being pushed off the screen by many Collection Labels. It is now possible to convert audio to MIDI from Push, using the Convert button. It is now possible to crop MIDI clips from Push 2. One unexpected thing I saw with Push and Live 10 was how Packs work. I can tell that the team at Ableton is really thinking on the design of packs and how they can take advantage of the different layouts in Drum Racks. I made this walkthrough video to give you a look at the new Drum Booth Live Pack coming with Live 10. Redesigned the Filter Envelope, LFO Envelope, and Pitch Envelope banks for Operator on Push 2, and added a visualization to the Envelopes. Visualization of filter bands was added to EQ Eight on Push 2. Added a new parameter layout and a graphical representation of the Activity View to Compressor on Push 2. Notes are now shown in Push 2’s Clip Mode, when a MIDI clip is selected. The velocity of each note is also indicated by the note’s opacity. I’m going to be writing more articles on Push 2 and Live 10. If your interested in staying up to date make sure you Subscribe to my youtube channel or join the Email List below. When I first got the push I was stoked! It has been such a centerpiece of my music creation. The only problem is I didn’t know where to put it. I kept moving it around on my desk for the best place. Then performing live had another question of where does it go. Eventually, I went down a rabbit hole of gear. After a lot of lessons learned, I have a list of the best stands for using the Push. These work for Push 1 and 2. One Stand to Rule them all and in the darkness bind them. 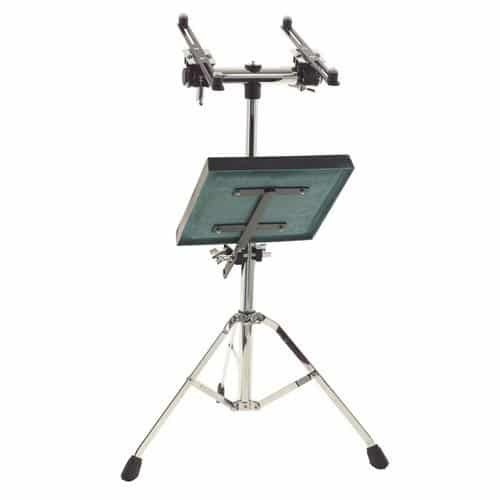 The Gibraltar Electronic Drum Mount Station is the bomb! This is by far the best stand for so many applications. From using an MPC to the Push. It is a perfect size and really stable for all that finger drumming. The only disadvantage is it’s a little big for when I am flying. It’s also expandable with different add-on mounting. It’s a whole system. Now… here are a few things to keep in mind using this for Push 1 or 2. The adjustable height range is great for standing up and Live Performance. Does not work well for sitting. The clamps adjust and keep the Push secure on the top but you must be sure you tighten them correctly. At a high height, the stand is a little less stable due to the center of gravity. It’s no big deal playing… but don’t knock it with your guitar, or add a little weight to the base. That being said this is a solid and great option for performance and standing up. As a cheaper option, there is the Samson Laptop Stand and I love it for the push. As of right now, the stand is around $50 and perfect for gigs and in the studio. The advantage to this one over all the others I will show is you can put it high enough to stand and perform. The disadvantage is the Push doesn’t quite fit. I had no problem with that and just had one side resting off the edge of the stand. Never an issue and this thing is solid. Next up, I have used this adjustable stand for my desk. This stand is adjustable for the angle you need. It makes it a lot easier to see the knobs / LCD screen on your push. This stand is also metal, sturdy, yet a cheap price. Total win for the desktop. The first stand I used for the push was a snare stand. I had some laying around and used it to hold the Push. this was great in the studio when I needed more space on my desk. I just put it on the Snare Stand and chair height. I don’t actually suggest buying a snare stand just for your push. It works, but if you are going to spend money I think the Samson stand would treat you much better. But, if you have one already or a friend sells one to you super cheap then this could be a good option for you. There are many different snare stands so finding the right one might be a little tricky if you are going for new. 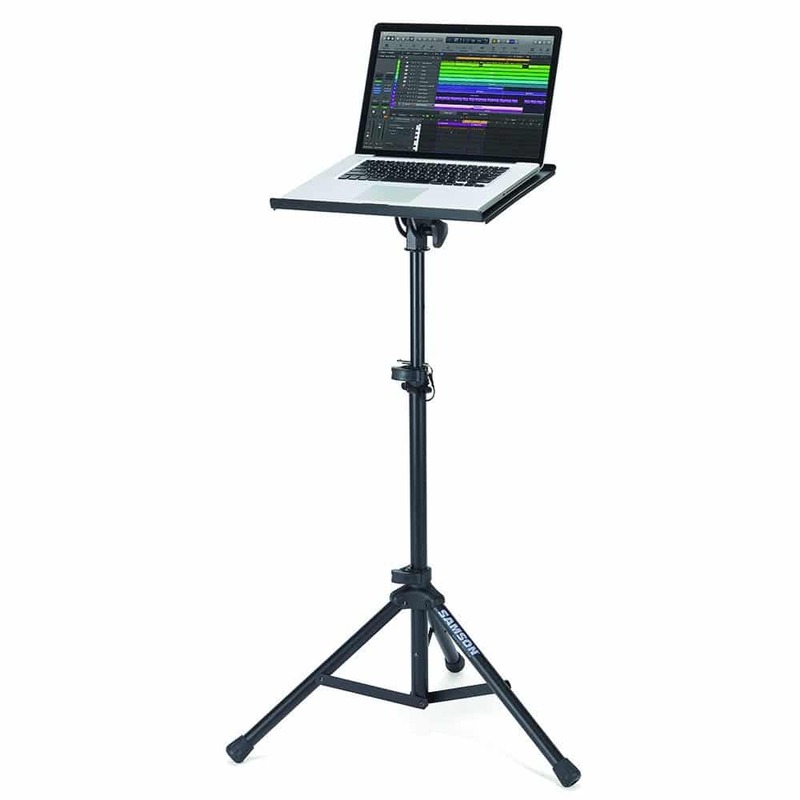 I did use this snare stand for the Ableton Push and it worked for my needs. There you have it, those are the 3 stands I suggest for the Ableton Push. If you don’t want a room full of random bits, stands, and half-baked projects like me then I suggest these 3. If you got any suggestions or things you think work better, please comment below. Ableton just announced the new Ableton Push 2! I had the opportunity to get my hands on the Push 2 and wanted to show you the 5 features I love in the new upgrade. The following video shows you my favorite features I learned right off the bat. Ableton live is also offering an amazing new deal. They have a trade in offer. The trade in offer will give you 30% off of your purchase for Push 2 by trading in Push 1. What I find amazing about this is the Push 1 is then going to be offered to schools and educational institutions. Not only do you save money, but your helping schools and music education. Well, now that I have the new push I will not be sleeping the next few nights. If you have any questions, feel free to ask them below and I will answer what I can about the Push 2. When you first get the push you can plug it in and start rocking out. It’s so easy to use the Note Mode to play new melodies in a chosen scale. I found that after playing with it for a while I sometimes wonder how to make different type of chords. Or when you are jamming with someone, it’s important to be able to communicate which notes you are playing. Because of this I made a worksheet to visually show off the note positions on the push as well as chord shapes. Below is the image I created to help in learning the In Key Mode on Push. You can download this image (Right click and Save Image As) and print it off for use in the studio. I have found this as an awesome tool to show off note positions to my students. One of the most useful things I found is to know that the blue key is the root note, and then memorize the note positions from there. Once you get that down you can easily know what chord, or note you are playing with the scale. Icaro Ferre is an amazing Max For Live developer. He has created amazing synths and utilities in Max For Live. His Grain Flux Synth is amazing and totally worth checking out. Today I saw his newest device that brings new functionality to Ableton Push. The PS-8 is a new Step Sequencer for Push. 8-step analog-style sequencer for the Ableton Push inspired by analog sequencers such as the Korg SQ-10 and Moog 960 Sequential Controller. PS-8 is great for live performance and improvisation. The main difference between PS-8 and other Push sequencers is that it uses the Push encoders to change the pitch / velocity of the eight steps and rows of pads to control other parameters such as gate length, shuffle amount and direction. Here is a video walk through of the PS-8. The blog at Ableton.com just released a great article on using the Push with External Controllers. I have been using the Push for a while and can see how it could be used really well for controlling external synths. This video gives a great rundown on how to use Ableton Push for external Controlling. Hopefully this opens up some new creative routes.